"Goods” any goods agreed in the Contract to be supplied to the Buyer by the Company (including any part or parts of them). 1.2.2	references to a condition is the relevant Condition in these Conditions. 2.1	Subject to any variation under Condition 2.2, the Contract will be on these Conditions to the exclusion of all other terms and conditions (including any terms or conditions which the Buyer purports to apply under any purchase order, confirmation of order, specification or other document, or which are implied by trade, custom, practice or course of dealing). 2.2	These Conditions apply to all the Company’s sales of Goods and any variation to these Conditions and any representations about the Goods shall have no effect unless expressly agreed in writing and signed by the Company Representative. 2.3	Each order for Goods by the Buyer from the Company shall be deemed to be an offer by the Buyer to purchase Goods subject to these Conditions. 2.4	No order placed by the Buyer shall be deemed to be accepted by the Company until the Company issues a written Acknowledgement or (if earlier) the Company delivers the Goods to the Buyer. 2.5	The Buyer must ensure that the terms of its order and any applicable specification are complete and accurate. 2.6	Any quotation is given on the basis that no contract will come into existence until the Company despatches an Acknowledgement to the Buyer. Any quotation is valid for a period of 30 days only from its date, provided that the Company has not previously withdrawn it. 3.1	The description of the Goods shall be as set out in the Company’s Acknowledgement. 3.2	All samples, drawings, descriptive matter, specifications and advertising issued by the Company and any descriptions or illustrations contained in the Company's catalogues or brochures are issued or published for the sole purpose of giving an approximate idea of the Goods described in them. They will not form part of the Contract. 4.1.3	the Goods shall be deemed delivered when notice is given by the Company that the Goods are ready for delivery. 4.2	Any dates specified by the Company for delivery of the Goods are intended to be an estimate and time for delivery shall not be made of the essence by notice. Subject to the Company giving reasonable notice, delivery may be in advance of any anticipated delivery date. If no dates are specified, delivery will be within a reasonable time. 4.3	Subject to the other provisions of these Conditions the Company will not be liable for any loss (including loss of profit), costs, damages, charges or expenses caused directly or indirectly by any delay in the delivery of the Goods (even if caused by the Company’s negligence), nor will any delay entitle the Buyer to terminate or rescind the Contract unless such delay exceeds 180 days. 4.4.3	the Company may store the Goods until delivery whereupon the Buyer will be liable for all related costs and expenses (including without limitation for additional handling, storage and/or insurance). 4.5	The Buyer will provide at its own expense adequate and appropriate equipment and sufficient appropriately qualified personnel to collect the Goods within 3 days of the notice given in accordance with Condition 4.1.2. 5.1	The quantity of any consignment of Goods as recorded by the Company upon despatch from the Company Premises shall be conclusive evidence of the quantity received by the Buyer on delivery unless the Buyer can provide conclusive evidence proving the contrary. 2 days of the date when the Goods would in the ordinary course of events have been received. 6.1	The Goods are at the risk of the Buyer from the time of delivery if delivery is to occur at the Company Premises or from the time of despatch from the Company Premises if delivery is to occur at the Buyer Premises. 6.2.2	all other sums which are or which become due to the Company from the Buyer on any account. 6.3.5	hold the proceeds of the insurance referred to in Condition 6.3.4 on trust for the Company and not mix them with any other money, nor pay the proceeds into an overdrawn bank account. 6.4.3	the Buyer encumbers or in any way charges any of the Goods. 6.5	The Company shall be entitled to recover payment for the Goods notwithstanding that ownership of any of the Goods has not passed from the Company. 6.6	The Buyer grants the Company, its agents and employees an irrevocable licence at any time to enter any premises where the Goods are or may be stored in order to inspect them, or, where the Buyer’s right to possession has terminated, to recover them. 7.1	Unless otherwise agreed by the Company in writing, the price for the Goods shall be the price set out in the Acknowledgement. 7.2.3	any delay caused by any instructions of the Buyer or failure of the Buyer to give the Company adequate or accurate information or instructions. 7.3	The price for the Goods shall be exclusive of any value added tax and all costs or charges in relation to loading, unloading, carriage and insurance all of which amounts the Buyer will pay in addition when it is due to pay for the Goods. 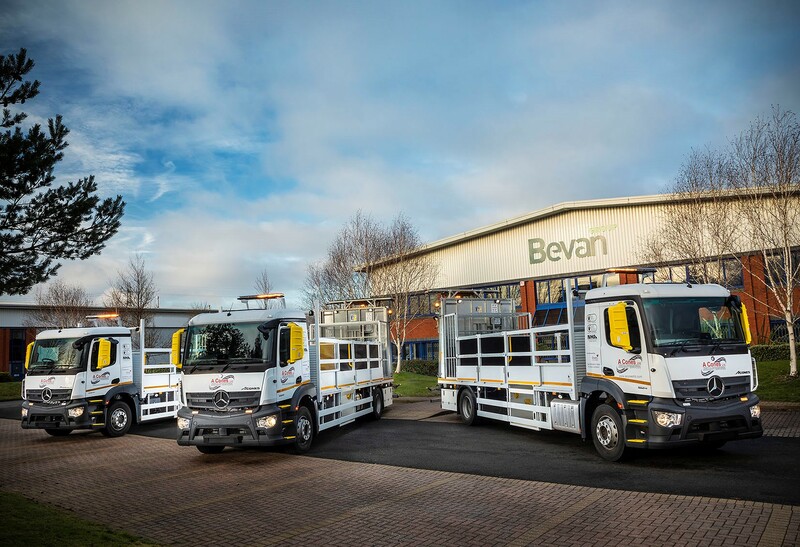 8.1	Payment of the price for the Goods is due and payable on completion by Bevan Motor Bodies Ltd.
8.3	No payment shall be deemed to have been received until the Company has received the full amount in cleared funds. 8.4	All payments payable to the Company under the Contract shall become due immediately upon termination of the Contract. 8.5	The Buyer shall make all payments due under the Contract without any deduction whether by way of set-off, counterclaim, discount, abatement or otherwise. 8.6	Notwithstanding any other remedies granted by law, the Company reserves the right to claim interest and fixed sum compensation under the Late Payment of Commercial Debts (Interest) Act 1998. 9.1	Where the Company is not the manufacturer of the Goods and in the event that the manufacturer has given a warranty or guarantee to the Company in respect of the Goods, the Company will endeavour to transfer to the Buyer the benefit of any such warranty or guarantee given to the Company. 9.2	All warranties, conditions and other terms implied by statute or common law (save for the conditions implied by section 12 of the Sale of Goods Act 1979) are, to the fullest extent permitted by law, excluded from the Contract. 9.3	The Company may provide additional warranties to the Buyer, such warranties to be in writing and signed by the Company Representative. 9.4.2	the Company is given a reasonable opportunity after receiving the notice of examining such Goods and the Buyer (if asked to do so by the Company) returns such Goods to the Company's place of business at the Buyer's expense for the examination to take place there. 9.5.3	the Buyer alters or repairs such Goods without the written consent of the Company. 9.6	Subject to Conditions 9.4 and 9.5, if any of the Goods do not conform with any warranty given by the Company, the Company shall at its option repair or replace such Goods (or the defective part) or refund the price of such Goods at the pro rata Contract rate provided that, if the Company so requests, the Buyer shall, at the Buyer's expense, return the Goods or the part of such Goods which is defective to the Company. 9.7	If the Company complies with Condition 9.6 it shall have no further liability for a breach of the warranty given by it in respect of such Goods. 9.8	Subject to Conditions 9.4 to 9.7, any Goods which are replaced under Condition 9.6 will belong to the Company and any repaired or replacement Goods will be subject to the terms of any warranty originally given by the Company for the unexpired portion of that warranty. 10.1.2	any representation, statement or tortious act or omission including negligence arising under or in connection with the Contract. 10.2.3	any other liability which cannot be legally excluded or limited. 10.3.2	the Company shall not be liable to the Buyer for any indirect or consequential loss or damage (whether for loss of profit, loss of business, depletion of goodwill or otherwise), costs, expenses or other claims for consequential compensation whatsoever (howsoever caused) which arise out of or in connection with the Contract. 11.1.2	any Company Materials shall, unless otherwise agreed in writing between the Buyer and the Company, belong to the Company, subject only to a licence in favour of the Buyer to use the Company Materials for the purposes of receiving the Goods. 11.2	To the extent that the Goods are to be manufactured and/or supplied in accordance with the Buyer’s Materials, the Buyer shall indemnify the Company against all liabilities, costs, expenses, damages and losses suffered or incurred by the Company in connection with any claim made against it for actual or alleged infringement of a third party’s intellectual property rights arising out of or in connection with the Company’s use of the Buyer’s Materials. This Condition 11.2 shall survive termination. 12.1	The Buyer shall not be entitled to assign the Contract or any part of it without the prior written consent of the Company. 12.2	The Company may assign and/or subcontract the Contract or any part of it to any person, firm or company. The Company reserves the right to defer the date of delivery or to cancel the Contract or reduce the volume of the Goods to be delivered to the Buyer (without liability to the Buyer) if it is prevented from or delayed in the carrying on of its business due to circumstances beyond the reasonable control of the Company including, without limitation, acts of God, governmental actions, war or national emergency, riot, civil commotion, fire, explosion, flood, epidemic, lock-outs, strikes or other labour disputes (whether or not relating to either party's workforce), or restraints or delays affecting carriers or inability or delay in obtaining supplies of adequate or suitable materials. 14.1	Each right or remedy of the Company under the Contract is without prejudice to any other right or remedy of the Company whether under the Contract or not. 14.2	The Contract (including the Acknowledgement) constitutes the entire agreement and understanding between the parties. 14.3	The Buyer acknowledges that it has not relied on, and shall have no remedy in respect of, any statement, promise, warranty or representation (whether made innocently or negligently) made or given by or on behalf of the Company which is not expressly set out in the Contract. 14.4	If any provision of the Contract is found by any court, tribunal or administrative body of competent jurisdiction to be wholly or partly illegal, invalid, void, voidable, unenforceable or unreasonable it shall to the extent of such illegality, invalidity, voidness, voidability, unenforceability or unreasonableness be deemed severable and the remaining provisions of the Contract and the remainder of such provision shall continue in full force and effect. 14.5	Failure or delay by the Company in enforcing or partially enforcing any provision of the Contract will not be construed as a waiver of any of its rights under the Contract. 14.6	Any waiver by the Company of any breach of, or any default under, any provision of the Contract by the Buyer will only be effective if giving in writing and will not be deemed a waiver of any subsequent breach or default and will in no way affect the other terms of the Contract. 14.7	The parties to the Contract do not intend that any term of the Contract will be enforceable by virtue of the Contracts (Rights of Third Parties) Act 1999 by any person that is not a party to it. 14.8	The Contract, and any dispute or claim arising out of or in relation to it or its subject matter or formation (whether contractual or non-contractual in nature), shall be governed by, and construed in accordance with English law and the parties irrevocably submit to the exclusive jurisdiction of the courts of England and Wales. 15.1.2	if to the Buyer, to the address of the Buyer set out in the Acknowledgment or such other address as shall be notified to the Company by the Buyer. 15.2.3	if sent by facsimile transmission on a working day prior to 4.00 p.m., at the time of transmission and otherwise on the next working day.